Blue Crabs: Rhode Island’s Next Big Shell Fishery? The Blue Crab, star of dinner tables everywhere. In a restaurant, on a plate, filled with meat and stuffing, the blue crab is a sight to bring a smile to the diner’s face. In a trap, on a crowded boat, filled with snapping claws, this very lively crustacean prompts much more caution than contemplation. It’s this latter encounter that URI Research Associates Barbara Somers and Chris Parkins are wrangling with on en early autumn morning on Point Judith Pond. The black wire traps they heave from the mud are commercial grade, but there is no commercial fishery in Rhode Island. Which is what brings the two out here: they’re gathering information about the location and population of Callinectes sapidus, the blue crab, with an eye toward determining whether Rhode Island could support a fishery. Currently in its first year, the study is focused on getting a population estimate, along with a feel for where the blue crab population is heaviest. The funds came from a U.S. 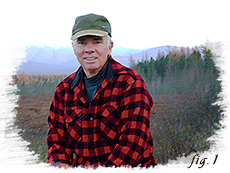 Fish and Wildlife grant to Rhode Island DEM. DEM’s Richard Satchwill, in turn, chose URI’s Fisheries Center to spearhead the assessment. The survey is measuring what is likely a direct result of climate change. According to a URI report, “The species composition of phytoplankton, fish and invertebrates has changed dramatically in Narragansett Bay since 1959.” Scientists are seeing strong indications that fish from colder climates such as black sea bass and winter flounder are in decline as a result of warming summer temperatures. Yet while this trend is producing one set of consequences, scientists also believe there has been a growth in the blue crab population for the same reason. The crab count is a component of turning mounting anecdotal evidence into proof. Another part of the impetus behind the study is prompted by problems with another shellfish: the lobster. The population of lobster has been suffering from lobster shell disease. 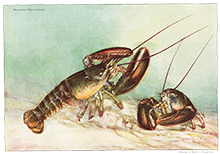 Scientists have yet to conclusively determine the cause of the disease, which causes as much as 30% of the lobster population to be afflicted with a decidedly unappetizing gray pallor. While current thinking is that there is no danger in consuming these lobsters, diners seem uninterested in seeing them on their dinner plates. The suspicion is that pollutants in the water may be the cause, but all that is certain is that it’s having a serious impact on the industry and there is no solution in sight. “Is the lobster the canary in the coal mine when it comes to marine pollutants? We’re not sure,” says Somers. 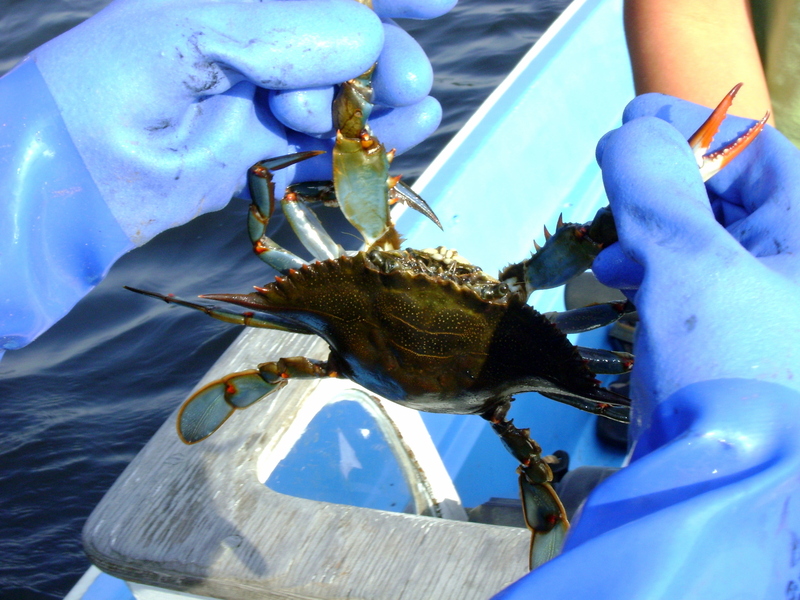 “We haven’t found any signs of this disease in blue crabs – yet.” Some see blue crabs as a way to compensate for the diseased lobsters. 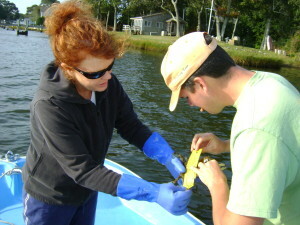 Somers and Harkins measuring and sexing blue crabs. 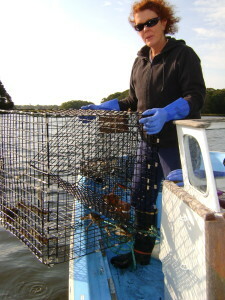 Back in Point Judith Pond, Somers reaches carefully into a cage of snapping claws, and draws out the first crab of the day. Before he comes out, Somers must carefully untangle his legs from the black plastic coated wire. Then she gingerly lifts him out to be sexed and measured. The “gingerly” part is primarily for the crab’s safety, but it is for Somers’ as well. Unlike some species of crabs, which can be safely handled if picked up from the back of the carapace, the blue crab’s long claws have no trouble reaching behind them, and pack a fierce pinch. This is not an animal to be trifled with, and gloves are de rigueur here. This crab is 15 cm. (nearly six inches) wide. The underside of its carapace features a narrow ridge like an arrow running up the middle, identifying it as a male. Once the measurements are done and the crab is sexed, Somers gives the shell a quick tap and determines that it is hard and in good condition. From there, back to the water it goes. This process is being repeated in estuaries in a half dozen locations across the state, often by commercial fishermen volunteering their time. “The local commercial guys have been really cooperative,” says Somers. Having the extra hands allows for a wider assessment than could be done by URI alone, because the process is a demanding one. The traps, baited with scup or butterfish, must be checked daily. If they aren’t, “You end up with one crab and a couple of empty carapaces,” according to Parkins. 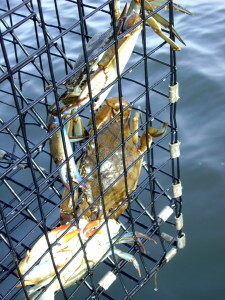 “These guys are tough fighters, and they will kill each other if they’re left in the traps too long.” There is a limit of eight crabs a day in Rhode Island at present, and that number has often supplemented the dinners of cash strapped URI grad students who are happy for the free meal. In addition to checking the pots for adults, URI has conducted a twice weekly monitoring of “crab settlement collectors”. Looking a bit like PVC tubes wrapped in air conditioning insulation, these objects were placed in the water in order to collect tiny baby crabs. “The most important information right now is to determine the distribution (where the crabs are)” according to Parkins. “This year has been trial and error. We may find a completely different picture in the spring. We know we don’t have the full picture yet. “Our hope is to get enough information on our end to create a full blown study. We did not know whether the crabs were here in good numbers. 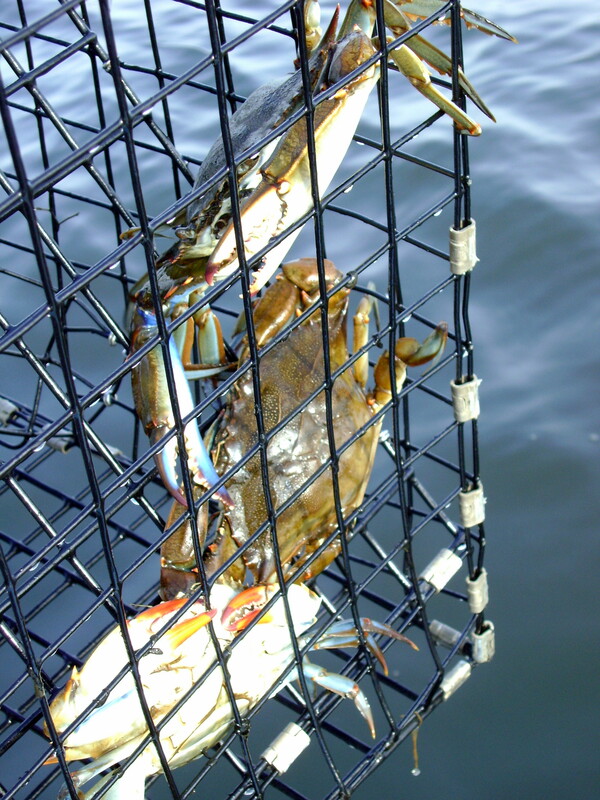 Other surveys have been tried in the past, but this is the most consistent survey so far.” The data collected will go to the Department of Environmental Management, which will make the call as to whether the ill-tempered blue crab will become a viable commercial fishery. It may be two to three years before the decision is made. In the meantime, Somers and Parkins will continue to ply their trade hauling traps, recording data, and generally trying to avoid those fearsome claws. 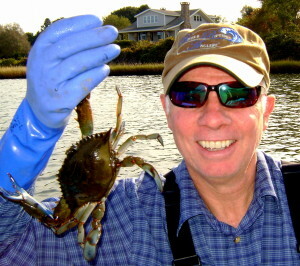 The author poses for a (very) quick photo before the crab makes him cry out in pain. You should try Green Hill Pond in Green Hill Beach RI i lived there for many years and have caught many of blu3ccrab there. Sounds good! Since URI is the outfit doing the work, I’ll pass along the suggestion. Thanks for reading!